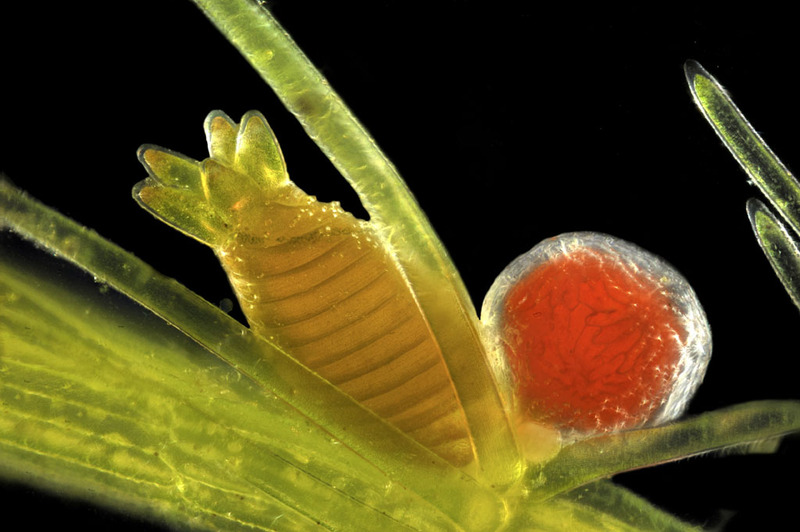 While fishing in my garden pond for Daphnia I noticed some Chara weed sporulating. I tried to make a picture of the oogonium and antheridium. I hope you like it. BDplan 20x, stacked in Zerene, 150 images. One SB900 in front, two SB700 from behind, D3, PB4 bellows. Can you tell us more about your setup? I'm especially interested in how you held or confined the subjects so they could be illuminated front & rear by the flashes and captured in only 150 images at 20X. Thanks! No problem, this is the setup. A carboard box, lined with black paper, holes at the side for the flashes and one hole on top for the slide with a well. I used a step size of 5µm. These structures are very tiny! Much better than the photo of the same subject in one of my best-loved botany textbooks! Thanks for the description of your setup. Very helpful! I have one more question: did you shoot through a cover glass, or just through the surface of the water? 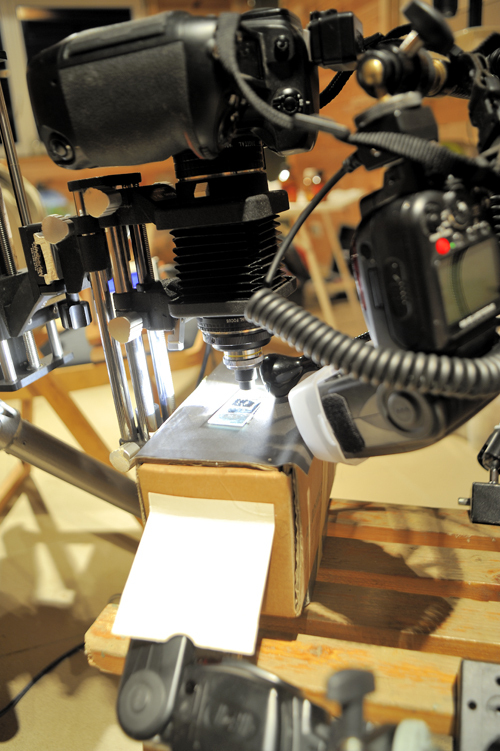 Excellent image and a very original darkfield illumination setup without microscope darkfield condenser. Although I certainly use coverslips for water mites and daphnia, in this case I did not. The plant itself was too wide. The structures themselves were tiny, so the welled slide was deep enough to put them under water completely. Maybe some explanation about the setup is requiered. I'm a general wildlife photographer with an interest in left-over subjects. Things my collegues don't like to picture. I do picture birds and landscapes, but I'm quiet known for my bats in flight, fish, troglobites etc.. Each year I tackle an other subject. At this moment, it is macro beyond 1:1. I try to picture my subjects with the equipment I have. I had to buy the optics of course (made a nice deal with Javier seta666), but someting as cool as the Bratcam is overkill for me as this is just temporary. Next year, I 'll probably try to picture flying bumblebees or canopy beetles or something. Some other species I made with this system are added below. Rollin, lovely images! 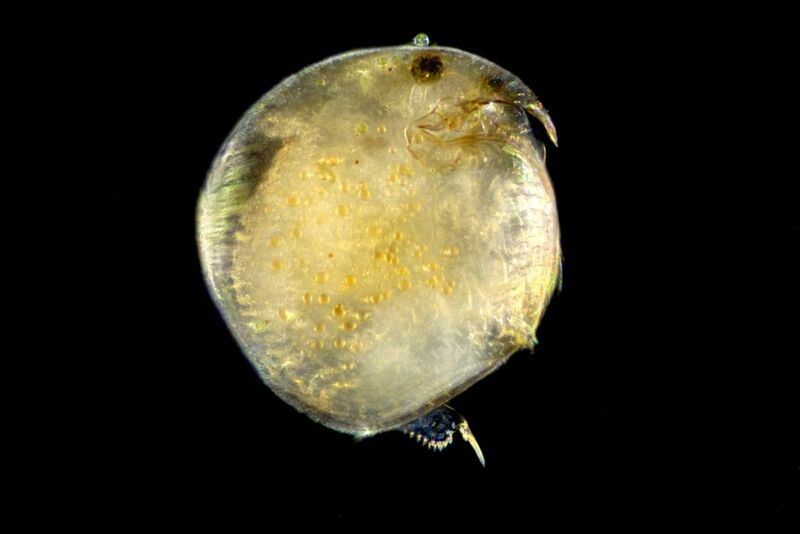 I came back to your chara shot several times today to study it, and then you added your water mite and daphnia. Of particular note, in my opinion, is the very skillful use of light in all these. Your remark about the Bratcam made my day. Thank you for your kind words. For most of the images I used my welled slide. For the newt egg I had to make more space by adding pieces of a broken slide at both sides of the well and a normal slide on top. Without this cover, the image was not so nice. By pressing the egg a little bit, I liked the result more. There is a darkfield ringlight intended for use with stereo microscopes that might be useful should you come across one. I was fortunate enough to pick up a Schott/Fostec product for USD $20.00 some time ago, but can't see any listed at present. A flash could be fired up the light pipe. Your images and the use of concavity 'well' slides for darkfield has prompted my attention. Gene mentioned a similar device and linked to some sample images. These should provide some idea what the gizmo looks like. http://www.gemologyonline.com/Forum/phpBB2/viewtopic.php?f=57&t=13714 (images 1 and 2, just the light guide and the attached ringlight sitting under the scope lens). *Note: I'd wait for confirmation from the microscopists if this approach would work before parting with any cash or entertaining the idea. It was just a passing thought when I considered your images and setup. 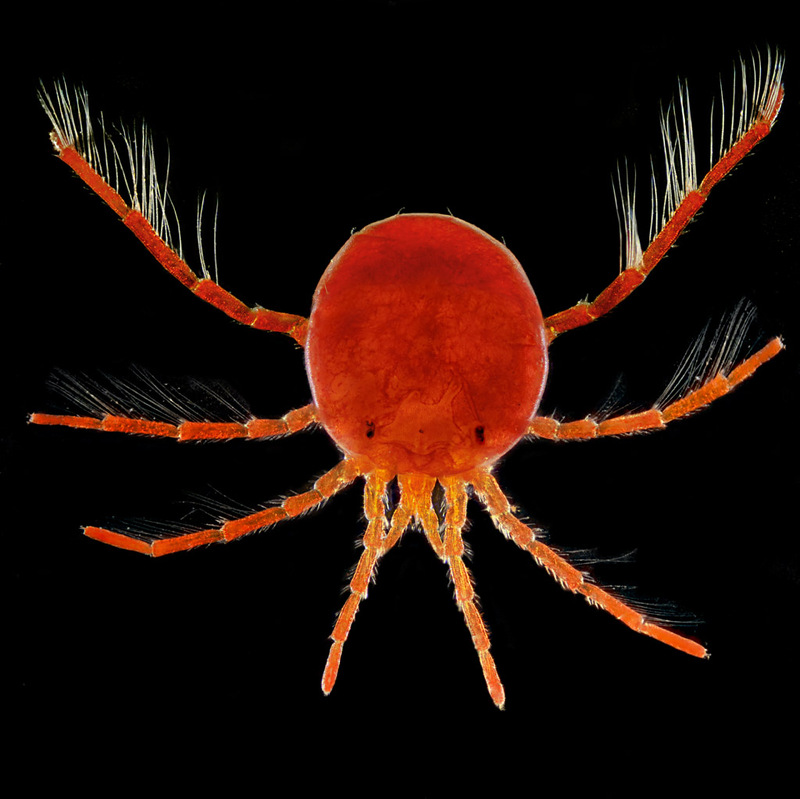 Nice images, I particularly like the water mite. Lovely images all and thanks for sharing your setup. Well done!